The Lake District Dairy Co. have recently introduced a new range of three quark-based cooking sauces. Varieties include: Garlic & Herb, Tikka and Tomato & Basil. If you've ever wondered what to do with Quark, look no further than The Lakeland District Dairy Co who specialise in this nutritious and low calorie product. Quark is a naturally low fat, high protein type of cream cheese which can be used in a multitude of ways. And with these new Quark cooking sauces, you can now make delicious and healthy meals (from scratch) in less than 30 minutes. I was fortunate to receive a lovely hamper full of ingredients including the three new Quark cooking sauces. With three recipes included, I couldn’t have been happier. Here were the family meals for the next three days all sorted. First up was Gnocchi with Spinach and Tomato & Basil Quark Sauce. This is described as 'great for adding a sumptious Italian twist to meat and pasta dishes'. According to the recipe sheet, using Quark cooking sauce instead of double cream results in 20g less fat, 11g less saturated fat and 167 fewer calories per serving. 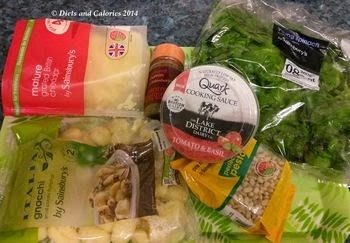 I’ve always wondered what Gnocchi tasted like but have been put off by the number of calories. Gnocchi are small potato dumplings which you boil in water, just like spaghetti. The 500g pack supplied contained 776 calories. Good points: it’s low in fat, saturated fat and sugar. 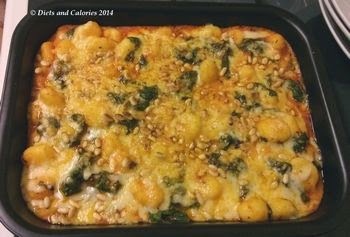 This recipe serves 4 people and has 371 calories per portion (less is you use half fat Cheddar cheese). This was so easy to prepare. Just boil the gnocchi in water for 2 minutes with some oil. Drain in a colander on top of the washed spinach – this wilts the spinach and helps preserve nutrients by not overcooking it. 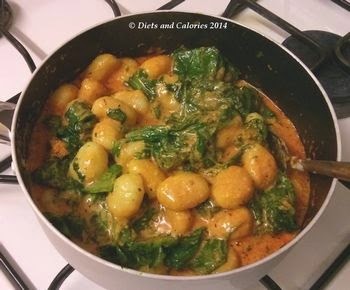 Then, heat the quark cooking sauce in the pan and tip in the drained gnocchi and spinach. Mix up and tip into a baking dish. Sprinkle on the grated cheese and pine nuts and grill until golden. This whole meal took 25 minutes from start to finish. It was simple, and provided a filling and substantial meal for a family of four. The only suggestion I would have made to lower the overall fat content would be to use half fat grated cheddar rather than full fat. I tried some of the sauce on its own. 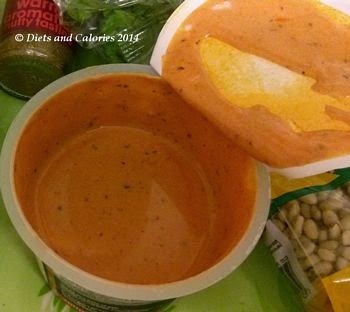 It’s gorgeous, mild and creamy with a lovely basil and tomato flavour. It makes the dish very creamy and seems quite indulgent. My main problem is the picky tastes of my family. Well, make that the kids. They’ve all got their own specific dislikes, but I decided not to pander to this nonsense and just dish it up as it was. Hubby loved it although he said he wasn’t sure what the taste was! Middle daughter also loved it, especially the crunchy pine nuts on top. However she left the spinach. 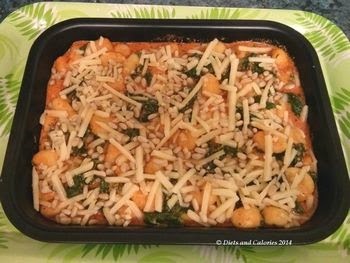 Youngest daughter said ‘yum’ when she started eating, but just picked away at bits, ate a few gnocchi, then gave the rest to hubby. Son ate a bit but said he didn’t like the squishy gnocchi. Ho hum! The sauce is delicious. I will definitely buy this again. However, I’ll be using it with pasta which youngest daughter would happily eat for breakfast, lunch and dinner. 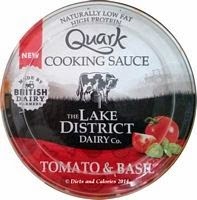 Lake District Quark cooking sauces can be found in the chilled cabinet section of supermarkets from Autumn 2014. Nutrition information per 100ml: 79 calories, 6g protein, 7.5g carbs, 6.3g sugars, 2.8g fat, 0.6g saturates, 0.6g fibre, 0.83g salt. Ingredients: Quark (from milk) (50%), water tomato and basil paste (23%) (Tomato puree (35%), water, flavourings (contain milk), sugar, sunflower oil, onion puree, salt, lemon juice concentrate, colour (paprika extract), basil, yeast extract, garlic extract), stabiliser (pectin), cornflour.